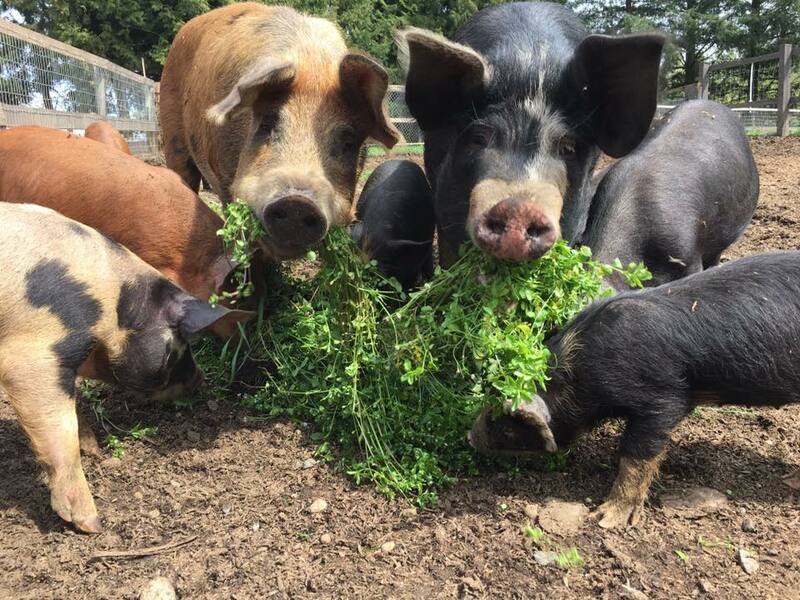 MERRITT – Small-scale meat producers across BC are banding together to form a new association representing farmers and ranchers who raise meat outside of the conventional system. The Small-Scale Meat Producers Association was founded by primary producers and their supporters following several months of online Facebook discussions that garnered the interest of about 75 ranchers and farmers. The online group was started by Julia Smith of Blue Sky Ranch in Merritt, which produces pork. “Through our online discussions about the state of services for small meat producers who are facing real challenges when it comes to abattoir services and availability, we decided the best way to have a stronger voice was to form an association,” Smith explains. In March, the group began the process of registering as a non-profit society in BC. The efforts coincided with a BC Ministry of Agriculture consultation launched March 20 aimed at supporting rural slaughter capacity. Small abattoirs and other stakeholders were asked for feedback and suggestions on how to improve rural abattoir licensing in BC, which many small producers have identified as an issue. The consultations were slated to conclude by April 30. The province asked current and former holders of abattoirs with D and E licences to describe their experiences with administration, licensing, operations and food safety. Presenters had an opportunity to discuss ideas that could enhance local slaughter capacity throughout the province. Class D licence holders are allowed to slaughter up to 11,340 kilograms (25,000 pounds) of their own or other people’s animals per year for direct sale to consumers or to food businesses such as restaurants and meat shops in the region the meat was produced. They must also operate in one of the 10 regional districts that have been designated as rural remote areas: Central Coast, Kitimat-Stikine, Mount Waddington, Northern Rockies, Powell River, Skeena-Queen Charlotte, Squamish-Lillooet, Stikine, Strathcona (mainland and Discovery Islands portion only) and Sunshine Coast. Class E licence holders may slaughter up to 4,536 kilograms (10,000 pounds) of their own animals for direct sale to consumers only in the area the meat was produced. There are currently 19 D-class licence holders and 27 E-class licence holders in BC. 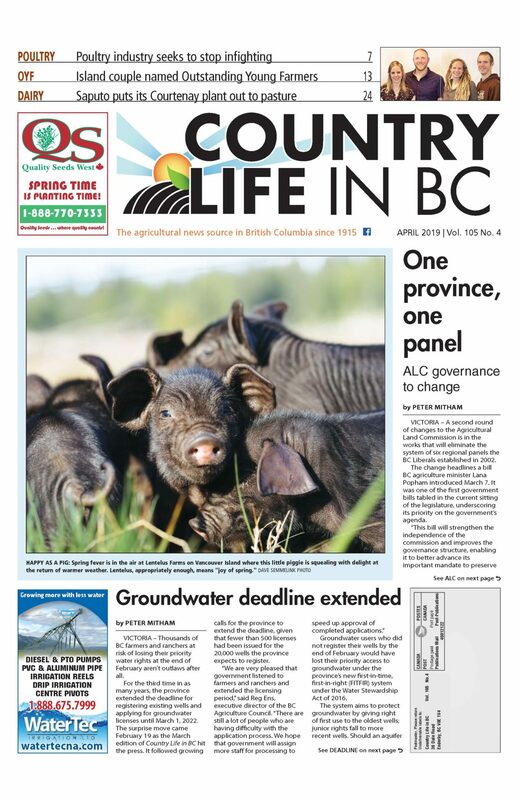 The ministry promised to also gather input from key stakeholders, including the BC Association of Abattoirs, the BC Cattlemen’s Association, and regional health authorities. Throughout April, the new association will be consulting with its members specifically to provide the ministry with broader industry feedback for consideration. Jim Ross of Havesome Hogs in Slocan Park is the regional representative for the Central Kootenays. Ross began raising sheep and hogs 12 years ago. Ross, who also works as an IT consultant, has an E-class licence that allows him to slaughter on the farm but today he sends most of the carcasses to expert butchers for cutting prior to direct sale to customers. He has easy access to butchers who cut, process and wrap his meat but like many farmers with E licences, the 10,000-pound limit doesn’t allow him to make a living growing food. If he wants to sell to a retailer or restaurant and follow current regulations, he must haul his live animals more than two hours away, investing in equipment and time he doesn’t have for no additional profit. “I don’t discount the work done by abattoirs, but feel hauling animals for over two hours is against my values and how my animals deserve to be treated,” he said. Ross is no stranger to fighting the ministry, which previously refused to renew his licence on the grounds he could use a newly established portable abattoir just down the road. After he supplied a letter from that operator saying that he won’t be able to deal with Ross’s animals, the ministry renewed his licence. But there’s a catch: he can’t hold his E licence and use the abattoir down the road under current regulations. This is why he supports the new association. “I’ve swam against the current for eight years. It’s a lot of work and you don’t accomplish anything. It’s easy to ignore Jim Ross and his concerns, but it’s harder to ignore an association with many members,” Ross says. In addition to a stronger lobby, he says joining forces with other small-scale meat producers enables the sharing of information and ideas across the province. It also stands to ensure everyone, both large and small-scale producers, are playing by the same rules. BC agriculture minister Lana Popham says BC’s meat inspection system is being addressed as part of the “Feed BC” element of her mandate. Small-scale meat producers who would like to be involved can join the association at [www.smallscalemeat.ca] or [smallscalemeat@gmail.com].